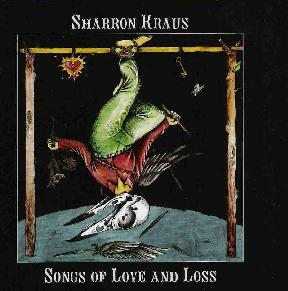 Sharron Kraus - "Songs of Love and Loss"
When I first read the words "Camera Obscura" and "folk music" together I immediately thought back to the "Serotonin Ronin II" compilation I reviewed a couple years back, and the portion of that album steeped in dark folky psyche-rock. This sounded even more enlightening, as it was indicated as more traditional British folk music. Indeed what Sharron and her many guests do is well outside the psyche-rock scene, but as dark and mysterious as anything. For a while I'd planned on saying that Sharron's voice maintains a certain limited tonal quality that may engeander tediousness for a 55-minute album, but that's only in case the style is new or difficult for you, as it gets less and less for me. Naturally acoustic guitar and voice form the basis for most of these tunes. "Gallows Song/Gallows Hill" begins the album, with a morose reverie and statement of contrast regarding nature's careless beauty hanging over a doomed victim. There's a lively banjo lick over Sharron's high-range, smooth and only slightly-stacatto vocal and ghostly low-mixed electronic-sounding breathy washes. There is a range of dark and lighter moods throughout the album, but really the solemn state of doom and dread pervades and must be realistically accounted for, though "The Frozen Lake" contrasts the atmosphere between mournful broodiness and a loftier more forward riff. "The Tree of Knowledge" is more doomy acoustic-guit churn and haunting cymbal crashes amidst the simple tale of temptation, exaltation and damnation. "Song and Dance of the Bees" continues the relentless assault of brooding intensity with wickedly jagged violin runs. "Song of the Hanged Man" has Sharron's best turn of vocal keys and most beautifully seraphic wails, ghostly cymbalic washes, bass clarinet and accordian supporting outrageous paradoxical lyrical pronouncements from another unfortunate fringe character. "Angelica Caraway" has some more delicate acoustic interweavings and "Still" is pure beauty, the damesel's melody curving sublimey and the clarinets weeping happily as well. "The Fastest Train" has a wonderfully cheerful air as well, propelled by a simple but positively-paced beat, despite low hints of a grating fuzzy guitar haunting the background... this song is actually "happy to be alive". Still, while songs may speak of love and life as well as loss, naturally the last word, expressed in the jadedly resigned "Murder of Crows", is death. "There's a murder of crows in the tree today, the rain's not washing my sorrows away, so I think I'll blow my brains away, because I don't love life anymore." So it goes. Is the love here as strong as its ensuing death? Either way, it's life-and-death-affirming music and a great album I feel fortunate to have nicked. I'm not at all knowledgeable of the basic music style here, and of course there are precedents which might be appropriate for me to appropriate from the bio, particularly regarding Sharron's style of singing, but I feel better leaving it as is. Cheers. For more information you can visit the Sharron Kraus web site at: http://www.sharronkraus.com. Songs of Love and Loss is distributed by Camera Obscura. You can visit their web site at: http://www.cameraobscura.com.au.